The next upcoming Kwanzaa is on Thursday December 26th, 2019. 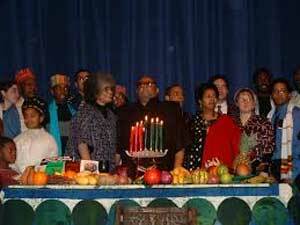 Kwanzaa celebrates African culture and traditions. It is observed on December 26 through January 1. Celebrations include candles and libations ending with a feast and exchanging gifts. Kwanzaa ceremonies offer music and drumming performances using the colors of red, green, and black- colors that reflect Pan-African. African history discussions are held as well as exhibitions of African influenced art. Families made include Christmas and New Year celebrations with Kwanzaa by having a Christmas tree and a Kwanzaa candle in their home. First celebrated in 1966-67, the holiday was created by Maulana Karenga giving those of African descent a time to celebrate their own cultural heritage; a means to reconnect with meditation and African traditions. Its roots are part of the black nationalist movement in the 1960's. It was first observed as anti-Christian or an alternative to Christmas early on but now both holidays are celebrated.